Lose up to 15 pounds and look years younger in just 2 weeks! Order your copy of The A-List Diet today! From red carpet premieres to TV interviews to unexpected paparazzi encounters, celebrities are always feeling the pressure to look their absolute best. So when it comes to slimming down, they want dramatic results now. 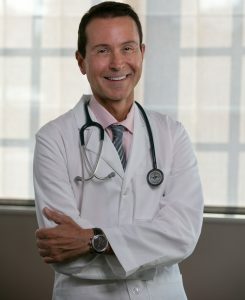 Dr. Fred Pescatore, author of the New York Times bestseller The Hamptons Diet, is sharing—for the first time—the secret diet he uses with his A-list clientele to achieve maximum results for losing weight and getting healthy. You can drop up to 15 pounds in as little as two weeks—while enjoying delicious and satisfying food! 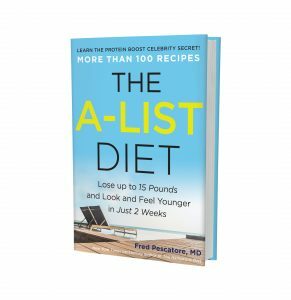 Filled with testimonials from Dr. Pescatore’s celebrity patients, The A-List Diet is your ultimate guide to losing weight. Get red carpet ready with the fabulous new you! Welcome to the LAST diet you’ll ever need! Are you fed up with trying to lose weight—and getting nowhere? Do you dread eating the same bland “diet food” day after day…while missing out on all the good stuff? Why does weight loss have to feel so hopeless…so exhausting…so impossible? After all the calorie counting, insane workout crazes, and fad diets…you still don’t look or feel the way you want to. What if I told you it’s time to leave all that behind, because now there’s a weight loss innovation that finally makes it so much easier to lose all the weight you want. Hi, my name is Fred Pescatore, M.D. I’ve pioneered a brand-new way to lose weight—and keep it off—that’s already being used by some of the world’s most famous faces. And when they come to my medical clinic in the heart of New York City, I show them exactly what to do to slim down FAST. Now, for the first time, I’m revealing exactly how this life-changing method works in my new book, The A-List Diet. In fact, when you follow the guidelines I’ve set out for you, you can lose up to 15 pounds in just the first two weeks! Without counting calories. Without a complicated point system. And without completely depriving yourself. In The A-List Diet, you’ll discover how to tap into the power of a specific combination of amino acids, which I call the “A-List” aminos. When you combine these “A-List” aminos in just the right way—to fit your individual dieter type—you’ll transform your body into a fat-burning machine that can melt away pounds like never before. Sugar cravings, hormone changes, weight loss plateaus… All those things that kept you from reaching your goals before will no longer stand in your way. Patient after patient at my New York medical clinic has demonstrated that with your own custom Amino Boost, your weight loss becomes faster…more efficient…and practically effortless. Best of all, you’ll even slow down the aging process from within and begin to look years younger. But it has nothing to do with you. So please, stop beating yourself up about getting stuck in a cycle of yo-yo dieting, because it’s NOT your fault. That’s why I’ve devoted my 25-year medical career to developing a weight loss breakthrough that actually works in the real world…for your real life! Instead of asking you to cut calories and never have another dessert again as long as you live…The A-List Diet shows you how to fuel your body for weight loss. When the foods and nutrients you’re eating work with your body, instead of against you, you transform your metabolic system into a fat-burning machine. That way you’re always being set up for success—not failure. And the Amino Boosting breakthrough I’m going to show you in The A-List Diet makes it so easy! This technique has become wildly popular among the many overweight and obese patients who come to my clinic for help with weight loss—including my so-called “A-List” clients. But a breakthrough like this needs to be shared with everyone. And that’s why I’ve decided to release this celebrity-trusted secret to the public in The A-List Diet. I want to show you how easy it can be to trim away the extra pounds that have been holding you back—and how you can keep it all off for the rest of your life, without driving yourself crazy. My patients are doing it every day, and I know you can do it too. It’s all waiting for you in The A-List Diet. P.S. I’ve helped thousands of overweight and obese individuals from all walks of life take back their health, and I can help you too. When you try The A-List Diet today, you could be as much as 15 POUNDS LIGHTER in just two weeks! Don’t wait. You deserve to look, feel, and live the way you want to. I can’t wait to hear your A-List success story.